Produced by RBC Global Asset Management's Chief Economist Eric Lascelles, the #MacroMemo covers what's on our economic radar for the week. In case you missed our latest economic webcast when it came out two weeks ago, here it is again: "Yield curve sends warning"
Green shoots continue to appear in the global economy. The consensus global GDP growth forecast for 2020 has edged higher for two consecutive months. This can’t truly be said to represent a new trend, as 2020 only started to be forecast three months ago. But it is certainly different than the negative trend evident in the 2018 and 2019 forecast revisions. For that matter, while the 2019 global forecast continues to edge lower, the downgrading is no longer quite so universal along geographic lines. A smattering of countries are enjoying slight forecast upgrades, whereas none were a few months ago. China has reported several further data points that argue the economy is stabilizing after a long swoon. This is important given that China generates a brain-bending one-third of global growth. The latest cluster of Chinese PMIs all managed to increase, adding on the prior month when one of the four PMIs rose. The amount of new yuan loans also exceeded expectations for a second-straight month. We are dubious that the Chinese economy can accelerate from here, but its trajectory looks to be flattening out, at least. After a bad February, when U.S. job creation was barely positive, the March data returned to normalcy with a +196K print. Other labour market metrics have remained healthy throughout. The U.S. ISM Manufacturing Index managed a surprise rebound in March, increasing from 54.2 to 55.3. That said, the ISM Non-Manufacturing Index fell further than was expected. This reflected the fact that several economic metrics continue to point downward in contrast to the greatest-hits list of sunny results. Financial conditions have indisputably eased now that central banks have staged a retreat. Fiscal stimulus is coming in somewhat ahead of initial expectations for 2019, as discussed in the next section of this memo. A fair portion of the growth deceleration represented a retreat from an unsustainably fast clip. This meant that growth should slow somewhat, not that it needed to decline indefinitely. All of this said, we continue to expect less growth on the aggregate for 2019 than in 2018, and a further slight deceleration into 2020. Do not forget that protectionism remains a drag, U.S. fiscal support is vanishing, and the prior growth rate was unnaturally fast. The business cycle is also late, pointing to risks that skew to the downside. We frequently refer to fading U.S. fiscal stimulus. By our math, the U.S. in 2019 has now lost the fiscal tailwind that blessed 2018, and is set to suffer a palpable headwind starting in 2020. However, this isn’t the end of the story. The global fiscal impulse is also worth evaluating. It appears to be slightly positive for growth. Most of the story is that several other countries are becoming more fiscally expansionary in 2019. However, there is also a definitional issue to clear up regarding the U.S. Technically, the U.S. can also be said to be fiscally stimulative in 2019, as defined by a structural fiscal deficit that is higher in 2019 than 2018. But we don’t ultimately count it as stimulus because other government policies such as tariffs, the government shutdown and measures to restrict immigration combined to offset the financial boost, even if they don’t show up in the government’s budget. As per the IMF’s new Spring 2019 forecast of structural fiscal balances, advanced economies on the aggregate will enjoy fiscal stimulus worth 0.3ppt of GDP in 2019, up from 0.2ppt in 2018. This argues for a 0.1ppt acceleration in the rate of developed-world GDP growth from 2018 to 2019. This has represented an upside risk to us for some time, since governments classically open the taps when confronted with slowing growth. However, this fiscal boost then reverses in 2020. The fiscal impulse reverses to -0.1ppt, translating into a theoretical deceleration of around 0.4ppt of GDP growth from 2019 to 2020. On a national basis, German growth suffered a 0.4ppt drag in 2018. It should enjoy a 0.6ppt boost in 2019, arguing for as much as a 1.0ppt acceleration in growth from one year to the next. Italy experienced a 0.1ppt boost in 2018. This follows a 0.3ppt boost in 2019, arguing for a 0.2ppt acceleration. In contrast to most, the boost then becomes a big 1.0ppt in 2020, arguing for something like a 0.8ppt acceleration in growth from 2019 to 2020. Canada enjoys a 0.2ppt fiscal boost in each of 2018, 2019 and 2020. This means more growth than otherwise, but no fiscally-driven acceleration from year to year. On other hand, the U.K. and Japan are set to experience a fiscal drag over the next few years. Outside of the advanced economy space, China is generating the biggest fiscal stimulus of the bunch. The IMF estimates a 1.2ppt boost to growth in 2019, with private-sector estimates more in the range of 2ppt. This is somewhat larger than in 2018, which managed a 0.9ppt boost. Thus, all else equal, Chinese growth should accelerate by between 0.3ppt and 1.1ppt. However, given a variety of other headwinds, we budget for a slight deceleration despite the fiscal effort. In summary, the world enjoys a bit of fiscal support in 2019 and this should be acknowledged. However, 2020 promises to be somewhat less supportive unless fiscal policy deviates from current expectations. It has not escaped our attention that WTI oil prices have bounced from a low of $42 per barrel at the close of last year to $63 today. This represents a 50% appreciation. Why has this happened? It is a mix of supply and demand factors. Economic growth has recently firmed, translating in theory into more demand for products like oil. Actual oil demand has risen notably in India and somewhat in China. The recent dovish turn by central banks translates into easier money. That, in turn, means better growth (hinting of more oil demand), additional inflation (prices go up faster, including for oil) and a less challenging comparison from an investment perspective to bonds (oil doesn’t pay a coupon, so the superiority of a coupon-paying bond shrinks when rates decline). Late cycle has classically been a fairly good time for commodity prices, though this is predicated on the idea that economic growth is unusually robust as the cycle matures. This has not been the story over the past year. OPEC has enacted significant supply cuts. These were motivated in large part by a desire to halt the decline in oil prices that plagued the market last fall, though conceivably also to ensure Saudi Aramco’s public offering receives a good price. Venezuela’s economic dysfunction has limited production there, while Iranian sanctions – while broadly feebler than first envisioned – are restricting supply somewhat. Alberta’s mandated oil production cut of more than 300K barrels has also helped to balance the global market, though the restrictions are now being lightened. Shale oil producers in the U.S. are demonstrating a bit more discipline in their production and expansion plans. Several implications extend from higher oil prices. First, inflation is set to run slightly hotter in the coming months. This was already evident in the latest round of inflation figures. A bit more is still to come as the latest oil machinations are factored in, alongside upward wage pressures. However, inflation is unlikely to become a problem any time soon. Naturally, higher oil prices are good for oil-exporting countries, and bad for oil-importing countries. Note that the U.S. has seemingly made the leap from the second category to the first one. Although it is not strictly a net oil exporter, it is becoming a net energy exporter. For that matter, the remarkable price elasticity of supply of shale oil producers is such that the U.S. economy appears to be helped slightly by rising oil prices and hurt by lower oil. The effect on inflation and growth should be fairly tame. The reason has much to do with a broader perspective of what constitutes a normal oil price. Six months ago, oil prices were higher than today, at $76 per barrel. Oil prices are not so much high today as they are no longer temporarily low. Framed in a broader context, oil prices were as low as $26 in early 2016. At the other extreme, they landed above $100 less than five years ago. Given the lags involved in mapping swinging oil prices onto the macro story, perhaps the most useful message is that oil prices are looking pretty normal, smack dab in the middle of the (modern) historical range. With regard to the price outlook from here, we have no great disagreement with current oil prices. Over the medium term, fair value is likely lower, perhaps as little as the $50 per barrel that U.S. oil producers claim is necessary to motivate additional supply. Over the long run, renewables could exert downward pressure on this. The Brexit deadline has been delayed yet again, now until October 31. This increases our conviction that a) no one wants an accidental (hard) Brexit; and b) a fairly soft Brexit is increasingly likely, most probably a customs union. Ontario’s budget was the frugal document that had been widely expected. 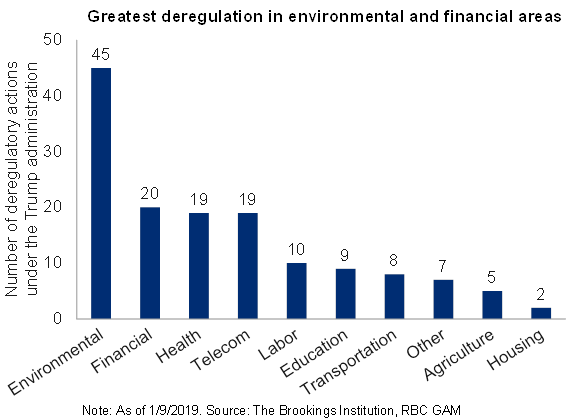 Courtesy of RBC Economics’ calculations, 20 of 25 major expenditure areas will suffer spending cuts over the next year. Overall program spending will rise by just 1.2% per year over the next four years. On an inflation-adjusted per-capita basis, spending is projected to fall by 1.6% per year. This restraint will translate into the theoretical elimination of the province’s long-standing budget deficit in fiscal year 2023-2024. Bucking the trend, additional funding was secured for health care, upgrading educational premises, a major subway line, and a new childcare tax credit. Disappointing some, there were no additional business-friendly measures or tax cuts beyond the accelerated depreciation announced last fall. On April 1st the four provinces that had declined to implement their own carbon tax regimes were subjected to a federal equivalent. Gas prices in Saskatchewan, Manitoba, Ontario and New Brunswick are now 4.4 cents higher per litre. The tax is not a cash grab in the sense that 90% of the money is returned to the households of each respective province. However, the change obviously has distributional consequences, hurting those that use the most carbon-based fuels and rewarding others. Higher gas prices are inflationary, but not by a lot. Gasoline for transportation represents 3.3% of the consumer basket. The price per litre has increased by around 3%. Given that the change affects around half of the country, it adds up to a mere 0.05% increase (albeit permanent) to consumer prices. After more than a year of ever-weakening global economic data and a particularly difficult stretch over the past five months, investors and analysts alike are on the lookout for green shoots. The theoretical support for the emergence of green shoots comes mostly from financial conditions. Whereas financial conditions had tightened significantly over 2018 and were set to cast a considerable shadow over 2019 growth, they have since eased due to the recent dovish pivot by central banks. The drag isn’t actually gone, but the negative impulse isn’t as bad as forecast at the end of 2018, and the peak drag on growth has arguably already past. To be clear, growth over the remainder of 2019 will continue to be weighed by financial conditions, but to a gradually diminishing degree (presuming no sudden change in financial conditions from here). The empirical side of looking for green shoots – tracking and interpreting data – is harder than usual right now, complicated by the seasonal distortions of Chinese New Year, a longstanding (but structurally diminishing) Q1 seasonal drag in the U.S., and the temporary damage of the U.S. government shutdown. These make it more difficult than usual to assess whether growth is slowing, stabilizing or accelerating in the world’s two major markets. Some (mostly proprietary sell-side) current activity indices have edged slightly higher, though certainly not all have (the Chicago National Activity Index continues to fall, for instance). Individual U.S. data points such as jobless claims remain strong, and certain measures such as core capital goods orders have rebounded. Aggregating all of this, the Atlanta Fed’s GDP tracker has increased its Q1 projection from less than 0.5% growth to the current reading of +1.6%. Neither is good, but the upward trajectory is welcome. China continues to deliver stimulus, and some leading indicators point to a stabilization in growth there. The global stock market has rebounded substantially since the start of the year. While some of this is an instinctual response to dovish central banks, some presumably reflects upgraded growth expectations due to the extra monetary support. Regardless of motivation, higher stocks create a positive wealth effect. Base metal and oil prices have been rebounding since last fall. The former, in particular, is a classic signal of economic demand. These developments are constructive and merit recognition. However, it is not the full story. There is still a powerfully negative narrative that also demands attention. On the theoretical side, U.S. fiscal stimulus has faded substantially relative to last year and the drag of protectionism has strengthened. Similarly, downside risks such as the aging business cycle (and an ominously inverted yield curve) substantially outweigh upside risks. From an empirical perspective, the key sources of worry are that PMIs are mostly still falling. U.S. industrial production also continues to roll over. Weighing the good against the bad, the proper conclusion at this juncture is that economic developments are no longer uniformly negative. This is notable, and welcome. However, it seems premature to suggest that growth is actively rebounding. Stay tuned. The Chinese government has responded to the country’s slowing growth in a variety of ways. China has accepted that as it becomes more prosperous, it cannot realistically grow as quickly as in the past. This is reflected in the country’s new 6.0% to 6.5% growth target, down from earlier projections. The downgraded outlook also reflects China’s desire to avoid re-inflating the debt excesses that so worried the world just a few years ago. While acceptance is part of the answer, China is also trying to prevent GDP growth from descending even further. A regimen of monetary, regulatory and fiscal stimulus has been delivered, though on a scale smaller than that of 2009 or 2016. First, much of China’s stimulus does not show up on the official federal balance sheet. Only a limited portion comes in the classic form of a bigger federal deficit. Much also sneaks forth via additional local government borrowing, off-balance-sheet activities and additional bank lending. Second, whereas Chinese stimulus in the past was mostly in the form of infrastructure – easy to target and the money indisputably makes its way into the economy – the latest round of stimulus has tilted more toward tax cuts. These have a less certain effect, particularly given the notoriously high savings rate of Chinese households. The fiscal multiplier is especially uncertain, and potentially lower than usual. With all of this is in mind, how big is China’s stimulus package? To some extent, any answer is premature, as the country will likely announce additional measures. The stimulus is undoubtedly larger than the projected increase of a couple of tenths of a percentage point in China’s official fiscal deficit (from 2.6% of GDP in 2018 to 2.8% of GDP in 2019). Bottom-up approaches argue that the stimulus is bigger than this. For instance, China’s corporate VAT tax cut alone should cost around 0.6% of GDP and be reflected in the official fiscal deficit. This is hard to reconcile against the government’s own forecast for a mere 0.2ppt increase in the official fiscal deficit, suggesting that there must be offsetting fiscal restraint elsewhere, perhaps in the form of more stringent tax collection or a reduced civil service headcount. More comprehensive estimates that reflect local government programs and off-balance-sheet borrowing (called the augmented fiscal account) point to stimulus of as little as one percentage point of GDP to as much as three percentage points. Most estimates tilt toward the lower end of this range. Even at the high end, this is no more than half the stimulus delivered in response to the country’s 2016 slowdown. Thus, the discussion should be more about economic stabilization than an outright rebound. Recall also that the stimulus could prove less effective than usual due to the way it is being disbursed, resulting in less of a boost than the fiscal stimulus estimates above. Tallying up the size of fiscal stimulus doesn’t provide a full accounting of government support, of course. Monetary stimulus and regulatory changes don’t cost money (directly, anyhow) and yet can also boost growth. On the other hand, China is grappling with several headwinds, including the country’s slowing housing market, deteriorating competitiveness and poor demographics. Global demand is also an important consideration and skewing more negative than positive. At this point, the Chinese economy seems likely to stabilize in the second or third quarter of the year, though we do not expect much of an acceleration. The country’s prior credit excesses and ongoing deleveraging effort limit the forcefulness of stimulus efforts. Without the stimulus, the country would have likely continued to decelerate to sub-6% growth. With the caveat that everything written here will become stale in a matter of days if not hours, here is a brief Brexit update. Having thrice rejected Theresa May’s transition deal and wrested control of the process from the government, British parliament held eight indicative votes over the past week to evaluate the main Brexit options. Unsurprisingly given the sheer number of choices, none captured more than 50% support. As such, there is no single path forward. Note that parliamentarians were allowed to vote in favour of more than one option, so the totals sum to well over 100. The votes were nevertheless instructive. For one, they tell us which options are unpopular, and so quite unlikely to be pursued. Unpopular options included remaining within the European Economic Area (a very soft version of Brexit – just 15% support), depart without a deal (hard Brexit – 29% support), and revoking Article 50 (cancelling Brexit altogether – 39% support). The votes also tell us which options were least unpopular, meaning that a path could conceivably be cleared toward the outcome. Two jump out. First, a permanent customs union received 49% support among voters (though, as with all of these votes, not all parliamentarians voted on each one and so it is equally correct to note that just 41% of all theoretical voters endorsed the option). We have long viewed this as the most likely outcome, and continue to see it as such. It would permit goods to flow freely between the U.K. and EU, minimize the border between Northern Ireland and Ireland and yet allow the U.K. to control immigration. Second, the option of holding another referendum to get greater clarity from the public received 48% support among voters. As with the others, the figure is lower when framed in the context of the fraction of potential voters (41%), but it is notable that this option received the most “yes” votes of all the choices. Of course, a second referendum is not an outcome in itself, but rather a waystation through which an eventual decision would proceed. Much would depend on the precise question asked in a referendum (whether, for example, it provides the option of “No Brexit”, or simply lays out a menu of ways to leave, or even asks the public for a yes/no vote on whatever option parliament recommends. Given public polling, we are inclined to think that either “no Brexit” or a fairly soft version of Brexit such as a customs union would likely be selected. We suspect the path forward will involve another round of indicative voting. Several of the options were close enough to 50% support that simply repeating the votes could elicit sufficient support now that everyone knows which options are truly in the running. For that matter, the voting may be re-held with the least popular options removed, further concentrating the vote. For now, the Brexit deadline has been extended to April 12th. Absent a deal by then, the EU says it is willing to delay a resolution into May, but not past the EU elections that occur late in that month. At present, it looks as though a longer delay than that may be necessary. While the EU is reluctant to grant this, its bluff will likely eventually be called as it is now looking logistically quite difficult to arrive at a coherent Brexit decision in time. Canadian GDP (Jan): Canada’s monthly GDP series rose by 0.3% in January, its best monthly gain in eight months. The performance was all the more impressive given that the mining/energy sector was down substantially, in part due to mandated oil production cuts in Alberta. To the extent those cuts have since lessened, it stands to reason that the sector’s drag should diminish in the coming months. Ultimately, January managed its solid gain thanks to gains in manufacturing and construction. The latter, in particular, doesn’t seem likely to persist given broad-based weakness in residential real estate. It is worth putting this increase into perspective – three of the prior four months suffered declines, arguing that the Canadian economy is still in a tough position. Our leading indicator aggregate for the economy remains weak and has been on a downward trajectory. Tallying this up to a quarterly frequency, Canadian Q1 GDP is now tracking somewhere in the 1.0% to 1.5% annualized range, a little higher than last forecast by the Bank of Canada. However, a hawkish turn from the Bank seems unlikely given that its fourth quarter forecast was too optimistic by nearly a percentage point. U.S. payrolls preview: Recall that U.S. payrolls rose by a mere 20K in February, representing a sizeable miss versus expectations and the weakest performance in years. Our best guess is that the February report was an outlier given that it substantially undershot the readings provided by the ADP and household surveys, plus that of jobless claims. Note also that the unemployment rate fell to just 3.8% and wage growth surged. These are not the accoutrements of a weakening labour market. To be fair, we shouldn’t expect March to fully counter February’s weakness, as some of that was in turn the result of unusual strength in January. But the bottom line is that a much more normal looking employment report is likely for March, perhaps even above the +178K consensus. Canadian employment preview: In something of a reversal of the U.S. situation, Canadian job creation has been unsustainably strong in recent months. While the happy January GDP print appears to align with that pattern, a more careful examination would concede that the economy has been quite weak. In turn, our best guess is that some of the recent strength will have to be relinquished in March, pointing to a minimal job gain or even a loss. Our Spring 2019 quarterly outlook is now available: “Central banks to the rescue”. The U.S. Federal Reserve (Fed) left its policy rate unchanged and scaled back its economic assessment last week, delivering on a widely anticipated tilt toward a more dovish setting. The central bank’s growth outlook was chopped by 0.2 ppt for each of 2019 and 2020, the unemployment rate forecast increased by 0.2 ppt and the inflation forecast fell by 0.1 ppt. However, the full extent of the Fed’s dovish pivot was more substantial than expected, contributing to materially lower bond yields. Two changes in particular were noteworthy. First, the Fed’s “dot plots” – the individual anonymous forecasts from all 17 FOMC participants for the year-end Fed funds rate – retreated more substantially than expected. Whereas the market and we had expected the median forecast to decline from a prior prediction of two hikes in 2019 to just one hike, the median forecast actually fell all the way to an unchanged policy rate for 2019. This doesn’t mean that the Fed is definitely done tightening monetary policy. While 11 voters favoured no change, six continue to predict further tightening, whereas none actively forecast a rate cut. Thus, the distribution surrounding “no hike” is skewed in an upward direction. Furthermore, the median forecast for 2020 is a single rate hike (though seven out of 17 voted for no increase in 2020 either). Of course, with the exception of the past few years, the Fed has erred on the side of predicting more monetary tightening than it actually manages to deliver. With this in mind, when the Fed suddenly brought its forecast down to the “no change” setting long embraced by the bond market, the market, in turn, felt compelled to retreat even further, now pricing in 73% of a 25 basis point (bps) rate cut by the end of 2019. An unchanged Fed funds rate is our best guess, with rate cuts and rate hikes both entirely conceivable, depending on how the economy and business cycle unfold. The second dovish development concerned the central bank’s balance sheet. The Fed decided to announce the contours of its plan to bring the era of quantitative tightening to a close. After years of quantitative easing that boosted growth and expanded the Fed’s balance sheet by a factor of nearly six, the Fed has, in more recent years, been working to shrink the balance sheet back to more tolerable proportions. The home stretch is now in sight: the Fed will scale back its net sale of Treasuries from US$30B per month today to US$15B in May, and will conclude the sales altogether by the end of September. This is slightly sooner than previously imagined. All of this constitutes more support for monetary policy than previously expected; it helps to ease U.S. financial conditions, and provides modestly more support for economic growth. However, a portion of the effort has arguably backfired as the Fed now finds itself painted into a corner. Not only is the Fed becoming more cautious about the future, but it no longer has any space left to boost morale further without reverting to rate cuts. That would be a dangerous game, as it would signal something profoundly wrong with the economy, possibly scaring investors and economic actors more than it would encourage borrowing. With this in mind, we had been of the opinion that the Fed would have been better off delaying the announcement of its pivot away from quantitative tightening, saving that last silver bullet for a future meeting when markets are in more need of a boost. The U.S. three-month bill to 10-year bond curve just inverted, meaning that the government three-month yield is now slightly higher than the government 10-year yield. The two-year to 10-year curve remains positively sloped for the moment, but only barely. This is an important development, as an inverted yield curve has served as a reliable predictor of U.S. recessions for several decades. The logic behind this is that bond yields can be thought of as a proxy for growth expectations over the relevant period. So if the market is looking for less growth down the road (10-year bond) relative to the current growth outlook (three-month bill), that signals a decelerating economic trajectory that frequently culminates in recession. What has prompted the curve’s inversion? From an economic perspective, it makes sense that the curve has been flattening over the past several years as the Fed raised rates at the short end (the primary driver of the three-month yield) and as an aging cycle started to dim longer-term growth and inflation prospects (reflected in the 10-year yield). We flagged 2019 as the likely year for an inversion some time ago. Furthermore, the most recent Fed decision arguably provided the final push past the inversion finish line. On the surface, this would seem illogical, as the Fed furnished a dovish rather than a hawkish decision. The three-month yield did indeed fall slightly on diminished rate hiking expectations, but this was outweighed by an even larger drop at the long end of the curve, pulling the 10-year yield down sharply from 2.61% on March 19 to 2.39% on March 25, on the basis of nervousness about the Fed’s dimming growth forecast and suspicions of the business cycle drawing to a close. Making matters (slightly) worse, the flattening in recent months has been of the “bull flattener” variety, meaning that the gap between long-dated and short-dated yields was shrinking on the basis of falling long-term yields rather than rising short-term yields. This signals growing pessimism about the long run, rather than rising optimism about the short-term outlook. First, most econometric models of the yield curve require that the curve be inverted for a full quarter before properly triggering a recession signal. That has not yet happened, and for that matter the yield curve could well flip back into positive territory before that happens. Second, and as we have noted in the past, the fact that the bond market currently lacks a term premium means that – in theory – the yield curve should have to invert by more than usual to provide a proper recession signal. However, let us not become too enamoured with this notion. Other measures of the yield curve, such as the Fed’s preferred one-quarter-to-six-quarter three-month T-bill forward spread, aren’t distorted by the wonky term premium and yet also just inverted. 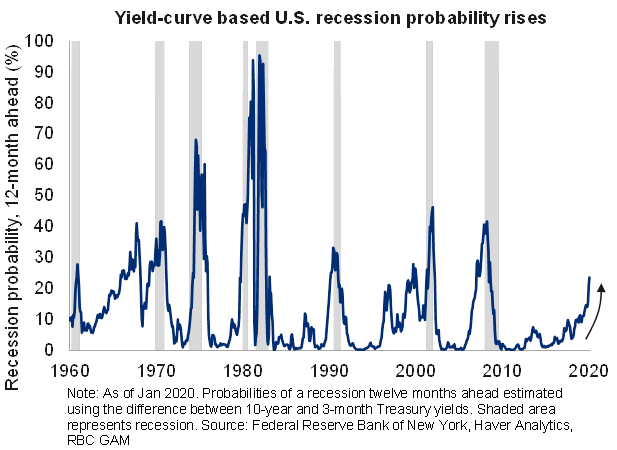 Third, on average, a recession occurs roughly a year after the yield curve inverts. Thus, this signal doesn’t predict a recession tomorrow, but instead prophecies a recession next year. That leaves a bit of breathing room. In conclusion, the inverted yield curve is undeniably bad news, but is not exactly a shock given its slow motion arrival, and the likelihood that a recession remains down the road some distance. 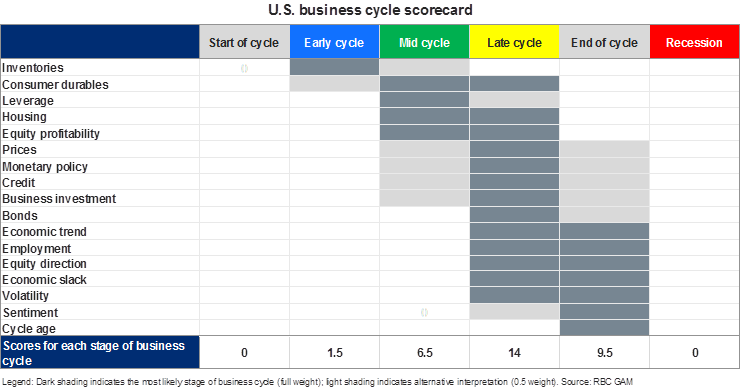 This aligns with our business cycle scorecard, which continues to provide a “late cycle” reading while acknowledging a growing number of “end of cycle” claims. We have argued for some time that the probability of a U.S. recession is in the realm of 35% for 2019 and 40% for 2020. With the recent inversion of the yield curve, formal recession models are starting to agree with that assessment. From a market perspective, we continue to advise only limited investment risk-taking given the lateness of the cycle, but not an outright retreat given the prospect of further near-term economic growth and relative stock-bond valuations. The full Mueller report itself is not yet public, but the main revelation so far is that the alleged conspiracy between Russia and the Trump 2016 presidential campaign was not proven. This comes as somewhat of a surprise given the Mueller probe’s 2,800 subpoenas, 500 witnesses and 34 indictments. Furthermore, Mueller opted not to rule on obstruction of justice claims. This leaves the matter in the hands of the Department of Justice, which has opted not to prosecute along this line. Of course, others in President Trump’s gravitational pull, including his campaign chair and his personal lawyer, have been found guilty of various offenses. To be clear, none of this nullifies roughly a dozen other investigations at the state and Congressional level that could yet surface new information or reach a different conclusion with the same information. Despite the many investigations that continue, the Mueller probe was undeniably the biggest and probably the most thorough of the bunch. As such, the odds of President Trump being impeached by the Democratic House of Representatives has surely declined, the possibility of his early departure before 2020 has accordingly fallen, and his re-election prospects for 2020 have arguably increased (though are still challenging). First, there isn’t much for investors or business – taxes were largely unchanged and no major improvements were made to the competitive environment. The taxation of stock options became somewhat less attractive for all but startups. On the other hand, small businesses may find it easier to access R&D incentives. Second, to the extent it is a spending-oriented budget, the entirety of that enthusiasm was enabled by faster-than-expected revenue growth in 2018-2019 and the assumption that this larger revenue base will persist into the future, rather than particularly fast spending growth penciled in for the next several years. In fact, projected nominal spending growth over the next five years is just 3% per annum. Of course, future budgets may yet depart from that plan. Housing: the government will take an equity stake of up to 10% in newly purchased homes, reducing the effective carrying cost to interested buyers. Alas, this seems likely to increase home prices rather than the intended goal of making the housing market more tolerable for millennials. It also exposes the government even more to housing market downside. However, the program is arguably inconsequential, with just $416M budgeted, and the program’s rules are such that homebuyers in the most unaffordable cities won’t be able to access much of it. Of greater relevance and assistance, if capturing fewer headlines, $9B of additional funding that has been provided to finance the construction of new rental properties. Training: the government created a new program for worker skill development, though the large number of training programs that already exist and the complexity of the new one argue it may not change the human capital equation by much. The seed of a commendable pharmacare program continues to germinate, with more details due this summer. Other changes include programs to encourage seniors to continue working, construct additional infrastructure, support Canadian journalism, and provide internet access to rural areas. Farmers will receive $3.9B in compensation for adverse changes to USMCA rules. Fourth, the federal fiscal position remains fairly good, with a deficit of less than 1% of GDP and a public debt-to-GDP ratio that is low and gradually declining. All the same, the government long ago abandoned its promise of a balanced budget by this year (current deficit: $15B) and although a steady-state forecast argues for ever-improving fiscal finances, a more realistic assessment that acknowledges the realities of the business cycle would concede that any future recession could blow the public debt substantially off course. The Canadian election is now fewer than seven months away, motivating these introductory thoughts. The incumbent Liberals have lately stumbled in the polls for a variety of reasons, including the recent SNC Lavalin scandal, unpopular carbon taxes, unsuccessful infrastructure efforts, a gaffe-filled state visit to India and a failed effort to negotiate a trade deal with China. A slowing economy could also begin to weigh. As a result, Prime Minister Justin Trudeau has lost a considerable amount of popularity, falling from 45% support to just 31.4%. At the same time, the largely unknown Conservative leader Andrew Scheer has grown in popularity, and is now tied with Trudeau. To the extent the current incarnation of the Liberal Party is built disproportionately on the back of Trudeau’s name recognition and popularity, this could spell trouble for the upcoming election. Recent provincial elections in Ontario and Quebec reflect an apparent public appetite for more rightward-leaning governments. The Canada Poll Tracker now assigns a 58% probability to a Conservative victory, versus a 42% chance of a Liberal victory. This represents quite a reversal relative to last year, when the debate revolved almost exclusively around a Liberal majority versus a Liberal minority. On the subject of majority/minority, the Conservatives are assigned a 31% chance of forming a majority government, while the Liberals are given just a 22% chance. The Conservatives have a 28% chance of a minority government, versus a 21% chance for the Liberals. Figures do not add to 100% due to rounding. Of course, much may yet change. Many months remain, the SNC Lavalin matter is not the juiciest of political scandals and so may fade from memory, and the new right-leaning People’s Party could siphon votes from the Conservatives. Platforms have not yet been written, but one can easily imagine markedly different stances on such matters as taxation, regulation and the environment. More to come. As we wrote last week, the half-life of any Brexit analysis is exceedingly short. This seems to be getting worse, not better. For the moment, the EU has agreed to extend the Brexit deadline to April 12. This provides a bit of breathing room, but a deal still needs to be struck. Parliament has seemingly snatched control of Brexit away from the government, with a recent vote now requiring a series of indicative votes to determine which of the many permutations politicians most support. This ranges from no Brexit all the way to an uncoordinated hard exit. This seems a logical approach, as no one option is likely to receive more than 50% support, making the traditional binary approach to parliamentary decision-making unsuitable. It remains notable that public attitudes have shifted against Brexit, and that parliamentarians – if allowed to vote according to conscience and across party lines – would likely support a softer Brexit rather than a harder one. As party discipline breaks down, this could prove decisive. Our latest monthly economic webcast is here “Central banks to the rescue”. The Fed decision scheduled for this Wednesday is set to be closely watched, if not quite as obsessively as the meetings in December and January. At that time monetary policy was undergoing a profound pivot away from tightening and toward a more neutral positioning. The Fed is now clearly on hold, and little is likely to change on that front. The fed funds rate is almost guaranteed to remain in the range of 2.25% to 2.50%. That said, this meeting may clarify several other things. First, how substantially will the Fed’s dot plots recede? The market’s best guess is that the median prediction of two 2019 rate hikes will retreat to just one hike. That remains ahead of the market’s own prediction of no rate increases. This seems like a reasonable guess. Presumably, some Fed participants will themselves anticipate no further rate increases, though they are unlikely to represent the majority of the dots. Second, the text was already substantially softened in the prior statement. Any further tempering is likely to be fairly tame, particularly as long as economic data remains mixed rather than purely negative. Third, the Fed is likely to downgrade its growth outlook modestly, given the extent to which global growth has continued to slow since late 2018. For context, our own forecasts were sliced by a quarter point from 2.50% to 2.25% over the past quarter. The inflation outlook may also be trimmed. Most of these views are broadly in line with the market. Relative to this consensus, we would highlight the risk that the Fed isn’t quite as dovish as the market hopes. This is in part because a central bank grappling with a sub-4% unemployment rate and a recent 20% rally in the stock market may wish to continue highlighting the possibility of a return to monetary tightening. Furthermore, even if the Fed has already worked out how and when it will end quantitative tightening, it might wish to save that canister of rocket fuel for a later meeting when markets could well be in need of a pick-me-up. Brexit views have, at best, a half-life measured in hours. Frankly, that might be an optimistic claim at the present juncture. A tangle of soon-to-be-resolved political scenarios vie with one another. A vote last Friday managed to substantially reduce the risk of the U.K. crashing haphazardly out of the EU, committing the U.K. to an extension past the official March 29 Brexit deadline. It will be a short extension if parliament manages to approve Prime Minister May’s exit plan, and a longer one if it fails to do so (requiring a return to square one). This doesn’t completely eliminate the hardest of Brexit scenarios given that all 27 EU countries must unanimously approve any Article 50 extension request. But, given favourable EU comments toward an extension, it means the accidental Brexit scenario is unlikely. For a moment, it looked as though there was a halfway decent chance that parliament might approve May’s third effort to vote through her customs union transition deal with the EU. Some hardliners were tempted to support the deal in recognition of the fact that its failure would likely motivate a cross-party effort for an even softer version of Brexit. However, the plan for a vote on Tuesday or Wednesday is now in doubt. Speaker of the British House of Commons has just shocked virtually everyone by rejecting such a vote on the principle that a single parliamentary session may not vote repeatedly on the same matter. Barring a sudden change of heart by the Speaker, a change to the proposed arrangement, or a radical effort to initiate a new parliamentary session on short notice, this would appear to force the U.K. toward a lengthy (potentially multi-year) extension of the Brexit deadline. In this scenario, the U.K. would then likely hold indicative votes to determine which of the many Brexit options is most popular among parliamentarians. Given the variety on offer, none are likely to receive more than 50% support. But the process could help to congeal cross-party support around a softer Brexit outcome. A delayed Brexit also raises the distinct possibility of a second referendum and/or an election. All of these scenarios further nudge the most likely outcome toward a softer version of Brexit, or even no Brexit at all. Thus, we continue to emphasize that while the chaos and the short-term uncertainty has undeniably mounted around Brexit, the odds of a bad outcome have shrunk as the risk of an uncoordinated exit and hard Brexit have both declined. Canada’s federal budget is published late on Tuesday. This is an election year, meaning that the government will be seeking to please voters. The Liberal government has been happy to run fiscal deficits throughout its tenure, justifying deficits during periods of economic weakness on Keynesian grounds and during periods of economic strength on the basis of enhanced fiscal space. The calculus for the 2018-2019 fiscal year has been significantly better than expected. Through nine of 12 months, the federal government is running an unexpected surplus of $324M, versus an initial forecast for a deficit of $18B. Granted, there are seasonal factors that should claw back many billions of this apparent gap over the final three months. But the point is that in the very short run, the government may be luxuriating in more fiscal capacity than it expected. On the other hand, the Canadian growth forecast has recently been cratering, potentially subtracting from the fiscal capacity in later years. The government has already delivered on accelerated depreciation for businesses. This was announced late last year, but will surely be played up again in the budget. Rumoured spending initiatives include: more support for child care, the beginning of a national pharmacare program, measures to enhance the skills of Canadian workers and possible support for seniors in the form of an option to delay RRSP withdrawals. Canadian governments at all levels have mostly been focused on cooling the housing market over the past decade. Now, recent weakness may prompt a partial back-tracking at the federal level. Two rumoured items include: a larger Home Buyer’s Plan limit (it has been frozen at $25K for a decade) and a possible increase in the maximum insured mortgage amortization period from 25 years back up to 30 years. Given recent suffering, the oil sector could conceivably receive a helping hand of some kind. While not especially likely, the CD Howe Institute has advocated in its shadow budget for a doubling of the threshold at which Canada’s top tax bracket begins, from around $210K to $420K. Were the government to deliver tax relief for high income earners, this would be easier for voters to swallow than an explicit reduction in the top tax rate. There has been radio silence on the key issue for investors of the capital gains inclusion rate. We presume the government will not be increasing it: tax hikes are rare during election years; the matter could have been pursued in earlier budgets, but was not; and when the capital gains and corporate income tax rates are tallied together, investors already pay a higher rate on their income than popularly imagined. The Canadian federal government debt-to-GDP ratio is already low and likely to remain on a downward trajectory, with an expanding economy offsetting a rising absolute debt load. While sustainable in theory, in practice the next recession could upset this happy equation. Two macro developments have pleased markets over the past three months: more dovish central banks and improving trade prospects between the U.S. and China. The first of these is entirely real. The second may not be improving quite as much as first hoped. Two weeks ago we happily conveyed word that U.S.-China trade negotiations were proceeding well, potentially with a constructive resolution by the end of this month. However, it now appears that the process has slowed. Instead of March, there is now talk of April or even May or June as the timeline for an agreement. Furthermore, and related to this, some issues are proving harder to resolve than initially hoped. We continue to believe that a U.S-China deal is reasonably likely, but that it may only be superficial, leaving key political and trade frictions unresolved. Furthermore, let us not forget that auto tariffs may yet surface from the murky depths in the coming weeks. All of this is to say that the protectionist issue has not yet been fully resolved – it remains in the “drag” column for 2019 and beyond. As we wrote last fall, we lean heavily on the work of recent Economic Nobel Prize winner William Nordhaus when assessing the economic implications of climate change. The damage is non-linear: the initial pain from a rising temperature is slight. It then grows exponentially as the temperature increase pushes further. The world is already around 1 degree warmer than in pre-industrial times, with the implication that the level of global economic output is already a few tenths of a percentage point lower than otherwise. There are huge error bars around where the global temperature will eventually end up. According to the Intergovernmental Panel on Climate Change, with aggressive policy solutions the cumulative increase might be restricted to just +2 degrees Celsius by the year 2100. On the other hand, doing little to alter the current trend would result in something like a 4.25 degree increase. These scenarios have dramatically different economic implications. The former subtracts 0.9% from the level of GDP, while the latter subtracts a big 4.1%. Converted into a flow variable, this amounts to an average of 0.01% and 0.05% less economic growth per year, every year, between now and 2100. While these impact figures may not seem very large, keep in mind that the global economy currently produces a remarkable $85 trillion per year of value. Even conservative projections for global growth of just 2% per year through 2100 (versus nearly 4% growth in recent years) puts the global economy’s annual production by 2100 at an astounding $432 trillion 2018 dollars. In turn, the difference between policy measures that successfully limit the temperature increase versus the continuation of the current policy trajectory is a high-stakes $14 trillion of theoretical lost output in the year 2100 alone, with similar damage done annually thereafter. These large losses argue that environmental mitigation efforts are actually quite cost effective when compared to the alternative. Higher temperatures and increased incidence of drought hurt certain forms of economic activity, like agriculture. It is costly to adjust to a changing climate, even in lucky regions where new opportunities arise to replace old industries. Climate change appears to bring about a greater incidence of extreme weather events that slow economic growth and damage the capital stock. On this last subject – extreme weather events – academics such as Dr. Friederike Otto of Oxford University have increasingly succeeded in differentiating via statistical techniques between weather events that are the result of climate change versus those occurring by chance. Naturally, the impact of climate change should vary significantly depending on the sector and country. Some controversial research goes so far as to claim that certain (mostly northern) countries could outright benefit. While the aforementioned growth forecasts represent base-case scenarios, risks extend in both directions. It is possible that climate change itself and/or its effect on economic growth may be less than feared. However, it is just as conceivable that the climate change and/or economic impact is worse than anticipated, with little understood “tipping points” potentially making for large negative misses. From an investment perspective, climate change represents both a risk and an opportunity. The risks are clear. Opportunities can arise by successfully anticipating changes to the environment, environmental regulations, social license, and the value of corporate assets (or lack of value, in the case of “stranded assets”). Companies successfully positioned to dodge the worst of climate change or to help mitigate it are particularly well positioned. China-U.S. trade negotiations are promising, with expectations that a deal will be struck by the end of March or in April. Negotiators have apparently made significant progress, though further distance is still necessary. It initially sounded as though the deal was mostly a rehash of familiar promises: buying more soybeans, purchasing more natural gas and lowering Chinese auto tariffs. It now seems as though some of the underlying issues may also be addressed, such as the forced transfer of technology from U.S. firms to their Chinese joint venture partners. There are apparently 28 pages in the deal on intellectual property matters alone. Expectations are that, should a deal be struck, the U.S. and China would likely roll back their third round of bilateral tariffs (on $200B of goods at a 10% rate). If true, this would represent a significant unwinding of tariffs, although the other tariffs would remain in place. However, keep in mind that non-tariff frictions are likely to persist between the two countries in the short term, such as by targeting individual companies. The U.S. and China are also likely to continue butting heads in the long run over issues such as the role of China’s state-owned enterprises. Even as U.S.-China tariffs plausibly shrink, there could be an offsetting expansion of auto tariffs elsewhere. China has been delivering a mix of monetary and fiscal stimulus for some time in an effort to stabilize growth. The fiscal stimulus, in particular, is hard to quantify. This is in part because announcements are continuing to dribble out. It is also in part because the type of stimulus is unfamiliar – tilted toward tax cuts as opposed to infrastructure – and it is hard to quantify the exact size of the stimulus. To illustrate the last point, China is officially targeting a fiscal deficit of 2.8% of GDP in 2019. That’s up slightly from 2.6% in 2018. This suggests a mere 0.2ppt of fiscal stimulus. However, the analysis is not quite as simple as this. Off balance sheet borrowing (such as via local government financing vehicles) can create a very different picture. Indeed, some pundits are looking for as much as a 2ppt fiscal boost, plus a further lift from monetary stimulus. If correct, this latter analysis makes a much stronger case for Chinese growth to cease its deceleration into the second half of the year. China recorded two notably positive data points recently. This was a welcome change for a country that has mostly suffered through negative trends for the past six months. One positive figure was the Caixin China Manufacturing PMI, which staged an unexpected and substantial rebound. The second positive reading was China’s aggregate financing figure, which raced to a record 4.6 trillion RMB in January. However, we are still unconvinced that the Chinese economy is truly bottoming. The credit figures may be partly distorted by the Chinese New Year, and other Chinese PMI figures do not corroborate the Caixin Manufacturing measure. Reflecting the structural element of China’s slowing economy, Chinese policymakers have now set out a diminished growth target for the coming year. Despite all of the aforementioned fiscal stimulus, China is now aiming for just 6.0% to 6.5% growth over the next year. That’s down from its 6.5% target for the prior year (and targets for previous years that ran even higher than that). Our forecast is for the low end of this range – 6.0% growth in 2019. This reflects the combination of a slowing global economy, diminished Chinese competitiveness, poor Chinese demographics, slowing globalization, the lagged effect of tariffs and domestic deleveraging efforts. In short, China’s latest stimulus efforts should not be discounted altogether. They could even be larger than officially reported, but there are plenty of headwinds jostling in the opposite direction. Amid a broadly decelerating economic environment, we are always on watch for any evidence of stabilization. While hardly overwhelming in number, there were several recent data points that presented a more positive story. As mentioned in the section above, China recorded improved figures for select PMI and credit readings. Also, in the EM space, India’s manufacturing PMI continues to rise. The latest S. Beige Book report – an anecdotal take on business conditions – reveals that 10 of 12 regions reported slight to moderate growth in the latest survey period, up from just eight over the period before that. Both the manufacturing and services sector were reported to have strengthened. That said, several details also acknowledge the challenges associated with the lateness of the business cycle: the rate-sensitive housing market is now sputtering, worker shortages are notable, wages are rising and margin pressures are being felt. We put a heavy weight on the direction in which the consensus global growth forecast is trending. The 2019 forecast remains on a downward trajectory – a familiar story, and one that supports our below-consensus growth forecasts. But beyond that, the 2020 consensus forecast recently edged slightly higher. This merits close watching. So far, it is just a single monthly increase and the gain was minuscule (merely 0.004% higher). Furthermore, the flagship OECD just downgraded its own global growth forecast for both 2019 and 2020 this week. Thus, while this fascinating new direction in the consensus could be a signal, it might only be noise. Time will tell. Canadian Q4 GDP: Canadian GDP laid an egg in Q4, growing by just 0.4% annualized. This is the worst performance since the Fort McMurray fires in Q2 2016. A big part of the latest weakness was also oil-patch related, with oil & gas extraction down by around 8%, as calculated by RBC Economics. But even without that concentrated drag, GDP growth would have been merely +1.0%. That’s still well short of the recent norm. The Canadian slowdown is not a huge surprise to us. This is in part because of our long-standing bearish stance on the country due to evident challenges relating to oil, housing and competitiveness. But it’s also unsurprising in part because our own leading indicator long ago turned lower, presaging this release. On a monthly basis, Canadian GDP has now shrunk in three of the past four months. Growth is more likely than a further decline from here, particularly as the sharpest part of the oil decline is over. But we continue to budget for below-consensus, underwhelming economic growth. Bank of Canada: The BoC was dovish in its latest rate decision. It acknowledged the recent run of bad data and the prospect of poor growth over the next few quarters. The BoC also dropped its reference to the need for the policy rate to rise to a neutral setting over time. 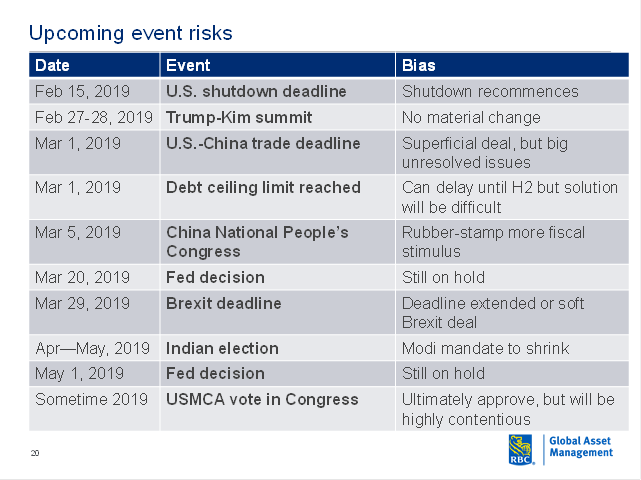 The market reacted to this news by reducing the probability of a Canadian rate hike by July from 18% to 0%, and increasing the probability of a rate cut from 2% to 21%. an updated projection that inflation will hit just 1.6% in 2021 (meaning it will still be short of the ECB’s target in three years). In response, the ECB has now committed to not hiking rates for the entirety of 2019. It had previously made this promise merely with regard to the first half of the year. Similarly, the ECB has now introduced a program that will begin delivering liquidity injections into the European banking sector beginning this fall. More broadly, the ECB is in the difficult position of never having lifted its policy rate off of the floor and never having shrunk its balance sheet. This will make any future downturn quite hard to manage. As the U.S. Federal Reserve pivots away from rate hikes, questions remain about the path forward for the Fed’s balance sheet. This issue took on a heightened relevance at the end of 2018. Markets were spooked at that time by Fed Chair Powell’s comment that the process of shrinking the central bank’s balance sheet was on “autopilot” – as opposed to being sensitive to economic and financial market developments. The appropriate lever for responding to sudden shifts in economic and market conditions is the fed funds rate, not the Fed’s balance sheet. To this end, the Fed has stopped tightening since conditions turned in late 2018. The fact that the decline in the Fed’s balance sheet has been a highly mechanical affair – with flows telegraphed years in advance – actually argues that the market couldn’t possibly have been suddenly hurt by anything having to do with balance sheet transactions. Primary dealers indicate that the Fed’s transactions have not in actual fact wreaked havoc on the Treasuries market. If the increase in interest rates over the past few years was primarily the result of a shrinking Federal Reserve balance sheet, the term premium should be actively widening, reversing the process that took place during quantitative easing operations. However, in practice, the term premium remains very low. When the Fed engages in quantitative tightening of the sort undertaken over the past few years, this doesn’t so much involve actively selling bonds. It involves waiting for bonds to naturally mature, and failing to reinvest the proceeds. The financial windfall is then erased from the balance sheet, in much the same way as the introduction of quantitative easing conjured money out of thin air. Only central banks are allowed to do this. The Fed’s balance sheet matters in the sense that it provides a means of delivering and withdrawing stimulus. In theory, printing money and expanding the balance sheet stimulates the economy via three channels: a larger money supply, lower bond yields and higher risk appetite. In practice, the first of these never really took hold over the past decade as banks sat on excess reserves, leaving the remaining two to do yeoman’s work. Now, as the process occurs in reverse, the question is the extent to which bond yields must rise and risk appetite must fall. To the extent that the bond sales have long been telegraphed and the bond market is forward-looking, it seems unlikely that yields have to rise much further on their behalf. 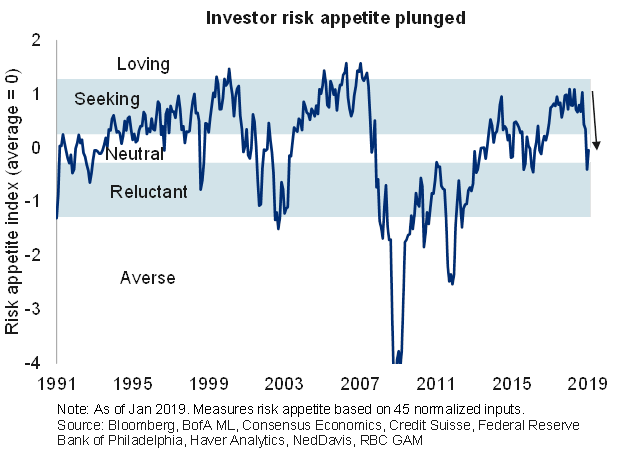 And we are equally skeptical that risk appetite must be damaged going forward. Keep in mind that the psychological boost that came from the initial application of quantitative easing was designed to restore confidence from rock-bottom levels to more normal levels. To the extent that confidence is now at a normal level, it makes little sense that confidence must collapse as those special measures vanish. The Fed is now arguably at least half way through its process of balance sheet reduction. This might seem a premature claim, given that the U.S. monetary base stood at just $800 billion before the global financial crisis, it peaked at a whopping $4.5 trillion in 2015, and has since merely fallen back to $4.0 trillion. But as a result of a growing economy, declining bank leverage and a declining velocity of money, economies need a far bigger monetary base than before just to sustain normal economic conditions. Forecasters peg the end point for the Fed’s balance sheet at somewhere in the $3.5 trillion range. At the current clip of $50 billion in net bond maturities per month, the Fed could well be done its remaining bond sales in under a year. More realistically, given a likely desire to smoothly decelerate, the process could take slightly longer. The balance sheet is again in play: expectations are mounting that the Fed could announce its final target and trajectory within the next quarter or two. It is hard to imagine the Fed remaining mum when the era of balance sheet reduction is evidently approaching its natural conclusion. Cautiously positive news has emerged on the U.S.-China file. After meetings between President Trump and China’s Vice Premier last week, Trump tweeted over the weekend that the March 1st negotiating deadline between the two countries would be extended. This means that the 10% tariffs on $200B in Chinese goods will not automatically jump to a 25% rate. However, existing tariffs between the two countries remain in place, meaning that our “negative” protectionism scenario remains the base case. Moreover, this constitutes far from a best case scenario. That would involve a deal being struck on time. The shifting deadline suggests the U.S. wants a deal, and potentially believes one is fairly close at hand. There is a good chance that U.S. demands have softened somewhat in this pursuit, perhaps motivated by jittery risk assets over the past several months. Not a great deal of progress had been made as of last week. China continues to pledge to purchase more soybeans and to reduce its auto tariffs, though these are fairly small gestures. More purchases of U.S. tech products could also be in the offing, though this is complicated by the fact that the U.S. is growing skittish about exporting too much high-grade technology to China. On the other hand, China is seeking to reduce U.S. pressure on its national champions. The big question is whether any changes occur to Chinese industrial policy: does China provide additional market access to foreign firms and/or change its intellectual property practices? From here, expectations are that President Trump and President Xi will meet in Florida sometime in late March or April to finalize a deal. We continue to believe that significant structural frictions will remain between the two countries, even after any superficial deal. On February 17th, the U.S. Commerce Department submitted its Section 232 (National Security) investigation on auto imports to the White House. This investigation was designed to create an opportunity for the U.S. to levy tariffs on imported European and Japanese motor vehicles. So far, the results of the investigation have not yet been made public. As such, we don’t know whether the investigation recommends tariffs or not. The White House has up to 90 days to act on the recommendations. Perhaps the Commerce Department felt that auto tariffs did not obviously improve national security, but the White House is keeping that information secret for now so as to maximize pressure on Europe and Japan. Alternately, perhaps the Commerce Department recommended auto tariffs, but the U.S. wishes to first solve the China trade dispute before knocking over another hornet’s nest. In this scenario, auto tariff threats might intensify in April after any Chinese deal. Europe and Japan are natural targets for U.S. trade policy, as both run substantial trade surpluses versus the U.S. In fact, Europe already agreed to trade talks last summer. Auto trade flows are large enough that any auto tariffs could significantly impede global growth. However, we also recognize that a large fraction of the European and Japanese vehicles sold into the North American market are already made in the U.S., Mexico or Canada. Brexit: Theresa May will give a speech on February 26th asking parliament for more time to renegotiate the Irish backstop with the EU. Conversely, a vote will be held on February 27th – with a rising chance of success – to take the Brexit decision partially out of the hands of the Prime Minister by requiring a formal extension of Article 50 if a deal is not struck with Europe by March 13th. Recall that the official Brexit deadline of March 29th is rapidly approaching. The declining risk of an uncoordinated Brexit, in turn, is prompting some of the Conservative Party members at the harder end of the Brexit spectrum to reconsider May’s original pitch, increasing the chance that it could succeed after some tweaks. In a nutshell, the odds of Brexit negotiations drifting beyond March 29th are growing, and the odds of an uncoordinated hard Brexit are falling. The latter, at least, is good news. Government shutdown: As widely reported, a second U.S. government shutdown in quick succession was avoided on February 15th. Congress and the White House reached an agreement to fund the U.S. federal government through the end of September. The budget furnished only $1.4B for border fencing – less than the $5.7B desired by Trump. In turn, the White House has declared a state of emergency, providing access via other means to the funding Trump desires for the border. Many U.S. states have now sued the president over his usage of the emergency laws, leaving an uncertain conclusion. The silver lining is that the shutdown will not re-emerge for another seven months at the earliest. Debt ceiling: On the other hand, the U.S. debt ceiling re-emerges on March 1st. But a sovereign default is still improbable given ample room to draw down on cash balances and engage other avoidance tactics. Realistically, the debt ceiling won’t become a pressing political issue for several months. Our quarterly deep-dive into the U.S. business cycle reveals a familiar conclusion: “late cycle” – but with some fascinating developments on the periphery. As usual, many of the 17 inputs that go into our scorecard of the U.S. cycle disagree with one another. Counterintuitively, this is the strength of the approach. Whereas nearly any assertion can be supported by a rogue data series somewhere, it is much harder to be misled (or mislead) when considering many angles at once. This is on evidence in the table, below. “Late cycle” is clearly the single best guess, receiving considerably more support than the rest. Although this has been the conclusion for many quarters running, there is considerable forward motion beneath the surface. Whereas a year ago “mid cycle” was giving “late cycle” an honest run for its money, the “mid cycle” argument has withered considerably over the past year. Simultaneously, the “end of cycle” argument has strengthened substantially, now representing the second-most plausible conclusion. Seven of the 17 inputs advanced over the quarter, versus just two that retreated. We also tackle the question of the cycle from a different, more binary, perspective – whether a recession is likely or not. Of the seven models we use, three ask whether the U.S. is presently in a recession. The answer is a definitive “no.” A further, lone, model looks at the extent to which the word “recession” has appeared in Google searches. This is well up over the past year. The final three models calculate whether a recession is likely in a year’s time. None indicates the risk is more than about 30%, but all acknowledge a rising, non-trivial risk. The yield curve model is particularly expressive, as shown here. Lastly, we examine 57 charts to inform the 17 official inputs. Several of the sub-inputs that go into this model reversed direction in the latest quarter. For example, our risk appetite index has fallen abruptly, to its lowest level in several years (see next chart). Similarly, the U.S. housing market is now rolling over, as shown in the next chart. To be clear, nothing here indicates a recession is imminent or that the cycle is over. But the cycle is nevertheless fairly late, and advancing. This continues to argue against aggressive investment risk-taking. It has been one of the key motivators for our reduction in risk-taking over the past few years, both with regard to the equity-bond mix and also the composition of the bond portfolio. The months ahead bring an unusual number of potentially pivotal macro events (see next chart). The U.S. government shutdown will recommence on February 15th if the negotiating committee is unable to reach a deal by then. A deal is most certainly possible, perhaps involving less funding of border security than the Republicans desire in exchange for a limited extension of Dreamer work permits. But recent news reports have blown alternately hot and cold on the likelihood of a resolution before that date. Moreover, even if the committee comes to an agreement on a tentative deal, the White House will have to approve. This is far from certain given President Trump’s stated demand that the wall must be fully funded – and his apparent indifference to a resumption of the shutdown. On the other hand, this is at least in part posturing, as the public has tended to blame Trump and the Republicans disproportionately for the shutdown. In the end, it may be slightly more likely that the shutdown resumes than that it is resolved, nicking up to 0.05% off U.S. annual GDP growth for every week that it lasts. The economic damage is fairly slight (and the U.S. Congressional Budget Office believes the economic hit is even smaller than the aforementioned figure). But it does nevertheless add up over time. And let us not forget that the start of the shutdown in mid-December coincided with a sharp decline in the stock market. The leaders of the U.S. and North Korea will again meet for a summit on February 27th and 28th. The last such meeting was viewed as a success, but little has truly come from it. A similar non-event is likely this time. We remain of the opinion that the U.S.-North Korea relationship is unlikely to substantially change, and that it represents only a small risk to global growth or human well-being. The game theory is simply too obvious: North Korea can never initiate a strike against the U.S. lest it be destroyed, and the U.S. is unlikely to initiate a strike against North Korea given the unacceptable casualties it and its allies might suffer. The biggest off-consensus risk is that the personalities of Trump and Kim clash in some way, regressing to the launching of barbs against one another, but nothing more. The U.S. and China have until March 1st to reach a trade deal before U.S. tariffs on a large cross-section of Chinese goods rise from 10% to 25%. We suspect a superficial deal will be struck. This will likely involve China committing to buy more U.S. goods like soybeans, a reduction in Chinese auto tariffs and perhaps a change in rules to reduce the forced transfer of technologies from U.S. firms to their Chinese partners. This, in turn, should preclude an immediate increase in the tariff rate. However, we do not expect existing tariffs to be rescinded. As well, many key American beefs about Chinese trade policy are unlikely to be resolved given the centrality of elements such as state-owned enterprises and capital controls to the Chinese economic model. There is still a sizeable risk that U.S. tariffs on China will rise further at a later date. The U.S. debt ceiling will return to effect on March 1st. This will potentially set up for another battle over the summer or early fall after special avoidance measures have been exhausted. Given a split Congress and the government shutdown debacle, it seems a pretty good guess that the debt ceiling will also prove a major issue in 2019. Whether the debt ceiling proves as problematic as in the summer of 2011 is another question. The battle in 2011 was sufficiently precarious that S&P downgraded the U.S. sovereign debt rating due to the risk of a technical default, and the stock market fell by as much as 10% during the episode. Outright disaster remains unlikely, however, as extreme preventative measures remain, if untested (and hopefully not quite to the farcical point of the Mint crafting a trillion dollar coin, as previously proposed). The U.S. economy is still easily capable of financing the public debt if politicians would only get out of the way. China’s annual National People’s Congress will begin on March 5th, lasting around two weeks. China could take the opportunity to get another major round of fiscal stimulus rubber-stamped. This would be a market-positive event. China is likely to downgrade its growth target for the coming year from 6.5% to the range of 6.0% to 6.5%. This is part of a steady slide lower. For context, 2016 targeted the range of 6.5% to 7.0%, 2015 targeted 7.0% and 2014 aimed for 7.5%. The event can surface other significant developments. As an example, last year’s Congress voted (2958 for, versus 2 against) to eliminate the two-term limit for Chinese presidents. Given that a downgraded forecast is already widely expected, there is upside risk to the Congress in terms of the magnitude of fiscal stimulus. The next few months bring two Fed decisions, on March 20th and May 1st. From this vantage point, the Fed is likely to remain on hold unless economic growth and sentiment reaccelerate. We suspect the Fed is already closer to neutral than popularly imagined. Too much ink has already been spilled on these pages about Brexit. Suffice it to say that March 29th is the official deadline for negotiating the exit of the U.K. from the EU. As with most negotiations, any solution is likely to be a last minute affair, though the deadline could alternately be extended in a variety of ways. Crashing out seems fairly unlikely still. Among several prominent EM elections in 2019, the next Indian parliamentary election may be the most important. It will be held in April or May. Prime Minister Modi and his BJP party – despite some wobbles and ultimately fewer economic reforms than anticipated – have managed to nurture rapid 7% economic growth in India, outpacing China in the process. At present, the party looks likely to be weakened by the election without losing control altogether. This would be interpreted by the market in a negative fashion. The new NAFTA deal still has to be approved by the legislatures of the U.S., Mexico and Canada. There is no specific timeline, though 2019 seems logical. The U.S. is the real question mark. We have always assigned a non-trivial 15% chance that the USMCA is not approved by Congress, reverting back to the pre-existing NAFTA or even (in a less likely, extreme scenario) to World Trade Organization (WTO) rules. That risk may now be edging higher given the political dysfunction on display with the government shutdown, plus recent comments in the New York Times that neither Congressional Republicans nor Democrats like the deal. Unlike with most laws, wherein tweaks can be made up until the last moment, it is much harder to modify an international agreement such as this, presenting what could be a problem. To be clear, we still think there is a good chance that the USMCA is approved because it is not a bad deal from a U.S. perspective. But political considerations could yet interfere. Many of the event risks discussed in the prior section are U.S. political events. There is one further item of relevance that falls outside of the purview of 2019: the 2020 U.S. presidential election race. Normally, an incumbent president has a very good chance of winning a second term. After all, four of the last five presidents have managed the trick, with only George H. W. Bush failing to secure a second tour of duty. However, betting markets put just a 37% probability on Republicans winning the 2020 presidential election. Undeniably, President Trump’s popularity remains quite low. Fascinatingly, a different betting market assigns a probability of just 27% that Trump himself wins the next election. How to resolve the 37% versus 27% disconnect? This means there is a 10% chance that another Republican wins the presidency. That would presumably entail either President Trump not running for a second term (as per Lyndon Johnson in 1968) or someone challenging Trump for the Republican nomination (quite common up until the last few decades) and outdueling him for it (has not happened in the modern era). Interestingly, these figures also imply there is more than a 10% chance that Trump is not the candidate, but that the alternative candidate then fails to win the presidential election. Technical math aside, the Democratic nomination may also prove quite interesting. Moderates are so far in short supply, with further-to-the-left candidates lining up in droves. They likely recognize that the anti-establishment root of the Trump message remains highly attractive to a sizeable fraction of the U.S. population, if wrapped up in very different policy proposals. The election, of course, remains anyone’s guess and could well end up with an unpopular Republican president versus a far-left Democratic nominee. This is arguably the market’s worst political fear as moderates would be in short supply, let alone those with a business-friendly inclination. In fairness, a moderate independent candidate would likely enter the race if this happened. Of course, there is still more than a year and a half until the next presidential election, leaving plenty of room for twists, turns, and for that matter, more conventional outcomes. Our latest monthly economic webcast is titled “Rebounding markets / slowing growth”. Adding to the bounty of your audio-visual entertainment this week, here is an Economic Outlook podcast I recently recorded with host Dave Richardson. In sharp contrast to our usual (and soon to be resumed!) tendency of discussing the slowing global economy and the various forces contributing to that dour trend, let us acknowledge the welcome burst of positive news that has recently bubbled to the surface. The S&P 500 just managed its best January in more than 30 years, reclaiming a big 7.9% of previously lost ground. Similarly, credit spreads have narrowed. This is clearly good news, and reflects some of the other positive news discussed shortly. However, this market performance can hardly be viewed in isolation. It comes on the heels of a hellish December that represented the worst December outcome for the S&P 500 performance in a remarkable 88 years. Overall, stock markets are still well down from their 2018 highs. U.S. job creation was a closely-watched affair in January, ultimately yielding a barn-burner of a report: 304K net new American jobs. This was nearly double the expected rate, and roughly triple the rate necessary to maintain a steady employment rate over the long run. It also represented the 100th consecutive month of job gains – a new record. We already knew that the U.S. government shutdown wouldn’t directly undermine the job figures. But there was the possibility that the shutdown would spook companies into scaling back their hiring plans. Similarly, financial market volatility could have iced hiring activity. Fortunately, neither of these fears were realized in the data – it appears the U.S. economy continues to chug along, at least for the moment. One counter-trend was the weakness of unemployment-related figures. The headline unemployment rate edged up from 3.9% to 4.0%. This was a small move, but it builds upon an earlier increase from 3.8% to 3.9% (and the knowledge that once the 3-month moving average of the unemployment rate has risen by 0.4ppt or more, a recession follows more often than not). The broader U-6 measure jumped up from 7.6% to 8.1%. And the latest weekly jobless claims hopped from the lowest reading of the post-crisis era (200K) to the highest reading since 2017 (253K). Does this suggest trouble brewing? Not obviously: the unemployment rates rose mainly on greater labour force participation rather than a dearth of jobs. The jobless claims spike appears temporary, possibly related to a second-order effect from the government shutdown, weather effects, Martin Luther King Jr. Day gremlins and a California teacher strike. The important ISM Manufacturing index bounced significantly higher in January, leaping from 54.3 to 56.6. This doesn’t completely undo the precipitous drop recorded in December. But it avoids what many (including ourselves) had feared would be a further decline as business leaders retrenched. 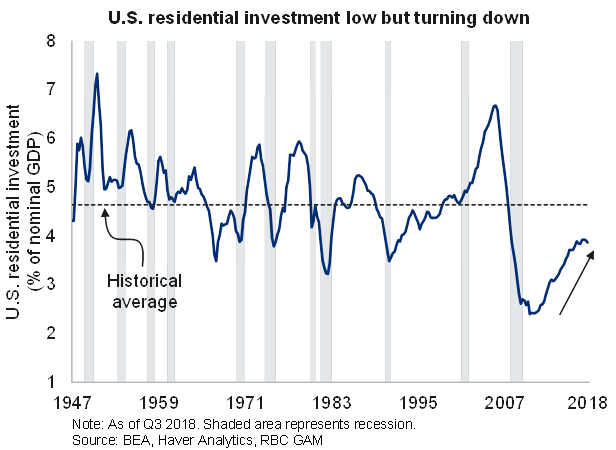 In turn, it would appear that not only are U.S. businesses still happy to hire, but they are also content to invest in capital. The much-feared confidence shock is not readily apparent in any of this data. Consistent with this, the key anecdote trickling back from Davos is that business leaders were less worried than expected. China’s latest round of PMI readings yielded some pleasant surprises. The government’s official manufacturing PMI inched higher from 49.4 to 49.5. The non-manufacturing version rose from 53.8 to 54.7. Given all of the sour talk about Chinese growth, this was welcome news. On the other hand, the privately-generated alternative to these measures – the Caixin PMIs – both fell. The manufacturing version declined from 49.7 to 48.3 and the service measure from 53.9 to 53.6. Which to trust more? Both arguably deserve some attention, though the latter may merit a greater weight given suspicions that the Chinese government smooths the economic data it reports. From a corporate perspective, Boeing made unexpectedly favorable comments about demand for airplanes – a potentially important result given the extent to which the company is representative of both cap ex intentions and spending more generally. Of course, the corporate evidence doesn’t line up solely on the positive side of the ledger. Caterpillar earlier reported the opposite trend, and it is no less a bellwether. The Fed continued to pivot in a more dovish direction last week. It eliminated its forward guidance for additional rate increases in favor of a message of “patience” and (in the case of the central bank’s gradual balance-sheet rundown) greater sensitivity to economic conditions. The statement downgraded the growth assessment from “strong” to “solid.” It also characterized inflation pressures as “muted.” As a result, no near-term hiking seems likely. This is a big deal for markets, as concerns about rising rates were arguably half of the reason that the stock market suffered its late-2018 tumble (the other half was slowing growth). Lastly, financial conditions indices are no longer as tight as they once were. This is because central bank expectations have retreated, bond yields have fallen, credit spreads have narrowed and the stock market has partially recovered. In fact, the U.S. financial conditions index has now unwound fully half of the tightening that occurred since last fall, though it remains a long way from the extremely loose conditions that briefly prevailed a full year ago. One of the expected drags on 2019 growth has slightly diminished its grip. To recap, then, there has been quite a lot of good macro news over the past week, disproportionately of a U.S. origin. Let us also not forget the end of the U.S. government shutdown just over a week ago. The U.S. economy continues to defy the downward trend dominating elsewhere. We would be remiss not to mention the combination of protectionism, fading fiscal stimulus and tighter financial conditions that should eventually tame U.S. growth. But for now theory is being trumped by a happier reality. Whereas U.S. growth remains good, the Eurozone has clearly slowed. This contrast comes as somewhat of a surprise as the latter region is much less adversely affected by such frictions as protectionism and diminishing fiscal stimulus. Italy has just reported a second consecutive quarter of declining GDP – a convenient shorthand for a recession. This isn’t quite as bad as it sounds, as the economy merely shrank by 0.1% and then by 0.2% – hardly the stuff of disaster. And keep in mind that Italy is notorious for its meagre growth, with the economy still smaller than it was in 2004. Still, these were the first quarterly declines in half a decade. In part, they were likely the result of the country’s new populist government and the resultant increase in borrowing costs. More worryingly, German growth has also slowed markedly. Industrial production is now down on a year-over-year basis and the economy shrank in the third quarter. While an outright recession is unlikely, Europe’s growth engine is clearly sputtering. The good news is that Germany has enormous room for fiscal stimulus should it so desire. The bad news is that Germany may well not desire stimulus, given its history of fiscal conservatism. French yellow vest protests continue, interfering with economic activity and also eroding Macron’s pro-growth reform plans. Europe is still an interesting place given cheap stock valuations and a business cycle that seems less advanced than in the U.S. But for the moment, the growth trajectory is clearly inferior. We don’t tend to talk much about the money supply – a radical departure from what was a central topic of economic conversation in the 1970s and 1980s. Other economic variables have simply proven more useful over the intervening years. 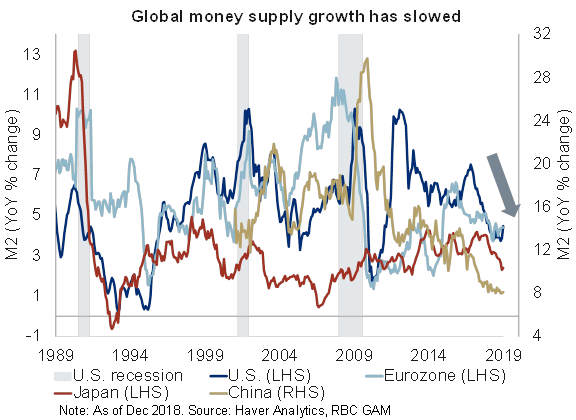 That said, money supply measures may be worth a moment of attention again, if only because so many countries are now experiencing the same decelerating trend in money supply growth (see next chart). However, divining the implication of this downward trend is more easily said than done. M2 growth – the money supply measure depicted in the chart – appears to lead and be positively correlated with GDP growth. As such, this is a negative economic signal. However, some analysts swear by the narrower M1 measure of the money supply. On the surface, this alternate measure is telling the same story: a decelerating trend. However, when we try to correlate M1 growth with GDP growth, we find that the relationship is actually inverted. Slower M1 growth implies faster GDP growth in the future. Thus, conflicting signals are emanating from the money supply, one arguing for slower growth, the other for faster growth. We can’t quite say that the two cancel each other out, but it helps to explain why money supply measures are no longer scrutinized quite as closely as in the past. In the end, we believe M2 growth deserves a slightly greater weight, meaning there probably is a decelerating economic signal embedded within the data. But note that even M2 has been far from failsafe as a signal. It did indeed predict the U.S. recession in the early 2000s. But it was accelerating into the 2008—2009 recession, thereby providing a false signal. And then all bets are off once a recession has actually begun: the money supply often surges due to central bank stimulus, rather than collapsing due to economic inactivity. In assessing the magnitude and sign of U.S. fiscal forces on economic growth, we have tended to focus on the tailwind from tax cuts versus the headwind from tariffs. However, the White House’s deregulatory effort is also an important consideration. 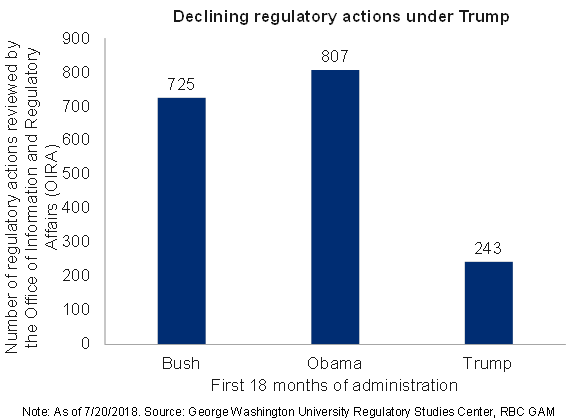 The next chart demonstrates, as per George Washington University calculations, that the Trump era has indeed delivered far fewer regulatory actions than the prior two presidents, by a factor of three or four to one. The final chart below notes that the greatest deregulatory thrust has occurred in the environmental and financial spaces. This squares with the view that President Trump has been particularly pro-energy and pro-banking sector. Of course, while deregulation provides a reliable short-term boost to economic activity, the subject is much murkier with regard to the long-term effects. It goes without saying that it is bad to dispose of good regulations, and good to dispose of bad regulations. The challenge is sorting one from the other. The clear risk, in this case, is that reducing environmental regulations damages the environment and thus may do long-term economic harm (not to mention societal harm). Reducing financial sector regulation could increase the risk of a financial crisis somewhere down the line. The U.S. government shutdown is now over, at least temporarily, after a record-setting 35 days of paralysis. The primary issue is not yet permanently resolved, however. In fact, it is not resolved at all. The announced three-week reprieve is merely meant to allow more time for negotiations. Neither party has changed their stance, though expectations are that the Republicans and President Trump may ultimately be the ones to make concessions on their demand for border funding, given that the public is disproportionately blaming them for the dispute. Estimates vary widely as to the economic damage done by the shutdown. Our figures are toward the high end of the range. Nevertheless, we imagine no more than a 0.25% upfront hit to annual GDP, with some of that subsequently recovered. While idled workers will receive all of their back pay, this does not restore the lack of output by those workers in the meantime. Coincidentally, we had previously budgeted for U.S. public policy to add around 0.2% to the level of 2019 GDP. As such, the shutdown has arguably just eaten through that remaining scrap of stimulus. Until recently, we were concerned that U.S. payrolls might announce a net job loss in January due to the shutdown. This is no longer an issue, in part because the shutdown itself has ended, and in part because Congress passed a law guaranteeing back-pay for affected workers. This resolved the technical definition of whether they were employed in January – they were. Either development would have been enough to avoid having the furloughed workers appear as unemployed. A great deal of economic data was not released during the shutdown. This will be addressed over the coming days, culminating in a Q4 GDP release later in the week (discussed below). Economic weakness hurt financial markets at the end of 2018. The question now is the extent to which that financial market suffering could, in turn, spook the economy. We have been watching confidence metrics for clues. So far, the evidence suggests some damage was done, but that confidence has not collapsed. Of the two U.S. consumer confidence metrics, the U. Michigan version has now fallen to its lowest level since 2016 (though still well above recessionary levels). At the same time, the Conference Board version has fallen, but isn’t even at its lowest level of the past year. For businesses, the ISM Manufacturing index fell sharply from 59 to 54 last month (though it represents a blurry mix of activity and expectations). Meanwhile the National Federation of Independent Business (NFIB) small business confidence measure has fallen to its lowest level in more than a year, but in line with the norm of the prior several years. The National Association of Home Builders (NAHB) metric of homebuilder confidence has fallen sharply and is at its lowest since 2015. But this likely has as much to do with higher borrowing costs and decelerating home sales as stock market volatility. Again, there is no evidence of collapse here. However, they are all down from late-2018 levels, and most of these measures have not yet published a January reading. This leaves open the possibility of a further decline. The Eurozone composite PMI fell again, to just 50.7 in January. This is down from nearly 60 a year ago. For context, 60 is a fabulous level, while 50 is the separator between expansion and contraction. Thus, it has been quite a descent. While we believe it is U.S. growth that should theoretically be pulled down closer to that of the rest of the developed world in 2019, it is undeniable that, so far, the greatest deceleration has occurred elsewhere. The January U.S. ISM Manufacturing report will be published later this week, having already fallen by a large 5 points to 54 in December. The consensus is currently for a roughly unchanged print in January. On the one hand, the stock market has since partially rebounded and the prior drop was unexpectedly large, suggesting room for a partial retracement. On the other hand, global growth is actively slowing and the December reading may not have fully captured the pain of the stock market’s late-December theatrics. We look for a below-consensus reading. The January U.S. payrolls report is expected to come in at +185K net new jobs, substantially down from the +301K generated in December, but still good by any reasonable standard. There is no evidence of significant layoffs occurring, with jobless claims coming in at a rock-bottom 199K last week. Hiring was likely somewhat cooler, though, translating into a sub-200K performance. U.S. Q4 GDP is forecast to rise by 2.6% annualized according to the Bloomberg consensus, and by 2.7% according to the Atlanta Fed nowcast. These are essentially the same number, confirming the notion that U.S. growth is indeed cooling after big +3.4% and +4.2% quarters. A less favourable inventory environment may contribute to the slowdown. Canadian monthly GDP for November is forecast to shrink outright, taking the annual rate of GDP growth down from 2.2% to just 1.6%. All of this is consistent with our leading indicator, which points to decelerating activity, and with our view that headwinds associated with oil, competitiveness and housing are beginning to restrict Canadian growth. Although its growth forecasts are unchanged for the moment, there seems a high probability that these figures will have to be revised down at the next opportunity, particularly given the recent Eurozone PMI reading. There remains much debate around when the ECB will deliver its first rate increase. What was once expected to be an early-fall proposition has now drifted into 2020. The market now prices in slightly less than a 50% chance of a rate increase before the end of 2019, and let us acknowledge that a fraction of such pundits argue for an increase not because the economy needs bridling, but for the opposite reason: because banks struggle in a negative-rate environment. As of 2019 and beyond, all Fed meetings are now theoretically “live”, in the sense that all will be accompanied by a press conference. However, there is still a subtle hierarchy to the meetings, with the March/June/September/December confabs still slightly more important by virtue of the official forecast updates that accompany them. For this Wednesday January 30th, no rate increase is likely from the current 2.375% level. In fact, the market has its doubts about any rate increases at all in 2019. We agree that too much was priced in last fall, though possibly the market has now overshot too far in the opposite direction. The Fed would still like to sneak in a rate hike should the opportunity present itself, though it is decreasingly likely that the timing will be in the first half of the year. Potential changes to the accompanying statement could include a tempering of the references to a “strong” economy, and inflation expectations may also be acknowledged as lower than before. With regard to the Fed balance sheet, half a trillion dollars have already been worked off, taking the size from a peak of $4.5T to $4.0T today. While the end point is not crystal clear, the talk is increasingly that $3.5T could constitute a natural floor, as opposed to counterarguments that run as low as $2.5T. Given the current rate of $50B in net maturities per month, the process of quantitative tightening could conceivably be done before 2019 is over. Whereas the pace of rate hikes seems highly flexible as per the needs of the U.S. economy, quantitative tightening is currently envisioned as a more mechanical process. The Canadian economy appears to be slowing. Canadian consumers deserve particular attention as they grapple with higher borrowing costs, high household debt, a relatively low savings rate and recent housing market wobbles. We have taken to watching the household insolvency data for any evidence of distress (see the chart, below). On the surface, at least, all is well given a low (and recently flat) personal bankruptcy rate. 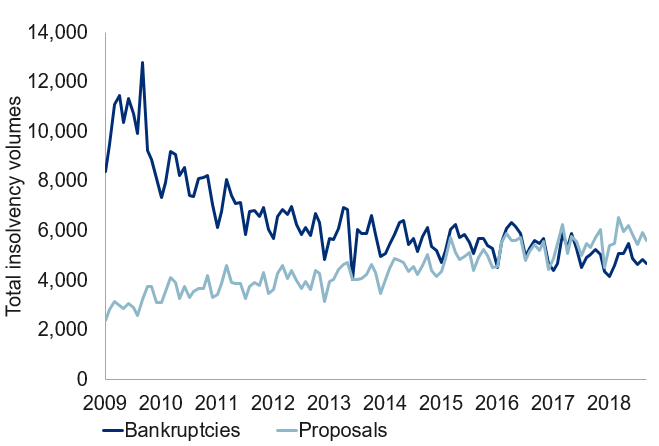 However, this masks a second metric – the insolvency proposal rate – which is actively rising, and now nearly three times higher than it was a decade ago (surprisingly, a moment when overall economic distress was itself quite elevated). Over the past year alone, Canada’s insolvency proposal rate has risen by a significant 12%. The declining bankruptcy rate may be partially structural in nature. Before bankruptcy is declared, the debtor and creditors attempt to negotiate a deal to partially repay the owed money. Only when this attempt fails is bankruptcy the natural recourse. It appears that such deals have become increasingly common over time. This in itself is arguably good news, as it avoids the more chaotic bankruptcy outcome. However, the fact that household insolvency proposals continue to rise argues that more Canadians are struggling to service their debt. And the fact that the rate of household loan growth has recently decelerated to its slowest pace in several business cycles would suggest that lenders are well aware of this development. Historically, the U.S. stall speed was 2.0%: virtually every time the annual real GDP growth rate fell below that threshold, the economy would shortly descend into a recession. There was arguably an exception to this rule in 1956 when growth subsequently rebounded, though a recession did follow in 1958. Why might a stall speed exist? There are two ways of thinking about it. First, when economic growth significantly underperforms, it worries businesses and consumers, who then reduce their investment, hiring and spending activities. This, in turn, creates a psychological vicious circle that ultimately resolves in a recession. Second, 2% GDP growth historically represents a significantly below potential rate of growth. When the economy is expanding at less than its potential rate, this means that the unemployment rate is rising and capacity utilization is declining. This then reduces the scope/need for additional spending/investment. The existence of a stall speed is less clear in other countries. Historically, Canada has generally abided by the sub-2% rule, but with notable exceptions in 1996 and 2003. The concept applied to the U.K. through the 1970s, 1980s and 1990s, but less obviously before or since. It is clear that Germany and Japan can sustain much lower rates of growth without stalling, though that doesn’t rule out the possibility that they simply have a lower stall speed than the rest. While we do not forecast sub-2% growth in the U.S. in 2019, the recent financial market shock paired with the government shutdown shaved our working growth outlook down to around 2.25% for the year. This is too close to sub-2% for comfort, at least if the historical stall speed applies. Fortunately, the idea of a 2% stall speed hasn’t found much support since the global financial crisis. In fact, U.S. growth has retreated below that threshold without consequence on four separate occasions since then: in 2011, 2013, 2014 and 2016. Naturally, no period of slow growth is particularly cheery, but no magnetic attraction toward zero was evident. First, it is clear that the sustainable economic growth rate is notably lower than it was before the crisis, for a mix of reasons having to do with demographics, innovation and a post-crisis malaise. With 2% now approximately the “normal” rate of growth, it is hard to imagine that a slight deviation below that normal would induce the kind of psychological damage necessary to conjure a recession out of thin air. In other words, any stall speed today should be considerably lower than 2%. o	Second, the structure of developed-world economies has shifted over time, placing a greater weight on relatively stable services and reducing the influence of the inventory cycle. In addition, a large fraction of spending now occurs automatically via recurring payments. This leaves less room for overreaction on the part of jittery businesses and households. The U.S. economy is nowhere near stall speed at present. Even as conventionally defined, U.S. growth is a good percentage point higher (3.0% versus 2.0%). To the extent that stall speed continues to exist, it is very likely lower than it once was, potentially at just 1.0% growth, or even less. Despite the fact that the stall speed does not presently play a central role in our thinking, we believe the recession risk is higher than normal due to a mix of economic headwinds paired with the late point of the business cycle. The never-ending-story that is Brexit continues to stumble raggedly along, from one crisis to the next. Last week brought the biggest ever government defeat in the history of the British House of Commons, when the Prime Minister’s proposed U.K.-EU Brexit pact lost by a staggering margin of 230 votes. The loss was not a surprise, though the magnitude was. Then, on the basis of that defeat, the opposition Labour Party demanded and secured a confidence vote to determine if the existing government could continue to function. The vote went along party lines, resulting in a slight majority supporting the existing government. This week, Prime Minister May is proposing a Plan B that would soften the Northern Irish backstop that has proven so contentious. The problem is that the backstop promises that Ireland and Northern Ireland will be effectively borderless forevermore via a customs arrangement that necessitates a permanent alignment of regulations between the two jurisdictions. The problem is that with this restraint the U.K. would then struggle to pursue a harder version of Brexit at a later date without having to effectively sever Northern Ireland off from the rest of the U.K. In many ways, Brexit seems barely closer to a resolution than it was a year ago. Virtually all options remain on the table. Then again, the very nature of political negotiations is that little progress is made until the last possible moment, which in the present context is still nine weeks away. That might not sound like much time, but it is an eternity for negotiators. It is often darkest before the dawn. A central challenge in all of this is that there are many possible permutations of Brexit, such that it is hard to get more than half of MPs to support any one option. The odds of another election have arguably just diminished slightly with the successful confidence vote. But the Conservative Party could yet itself fracture and necessitate an election. The odds of a second referendum continue to rise as other options are crossed off, one by one. We continue to stubbornly believe that some form of customs union remains the most likely solution, not so much because it makes anyone particularly happy, but because it fails to cross the red lines associated with controlling immigration and minimizing the Northern Irish border. The second most likely scenario is no Brexit at all, given the reality that a large fraction of British MPs do not actually support Brexit themselves, despite what their constituents have said. Of course, that would require working across party lines, a concept that has been foreign so far. For that matter, public support for Brexit is lower than it was at the time of the original referendum. The risk of an accidental hard Brexit seems fairly low, in part because no one wants that outcome -- in part because courts have ruled that the U.K. can unilaterally withdraw its Article 50 declaration at any time, and in part because most such threats are transparently a negotiating tactic. While many possible outcomes remain, we feel that a softer outcome is more likely than a harder one. The ongoing U.S. government shutdown continues extend deeper into record territory, now stretching for 31 days. In so doing, the shutdown has already exceeded initial expectations. Of course, with Congress split between Republicans and Democrats plus an iconoclastic president in the White House, it was never going to be easy. So far, the public are putting most of the blame on President Trump and the Republican Party. However, it is an open question whether that thinking could begin to shift now that the President has proposed a compromise to the Democrats, which was seemingly rejected out of hand. The specific proposed compromise – a possibility we discussed in these pages a few weeks ago – involves funding border security as per the White House’s demand, but also extending work permits for illegal immigrant “Dreamers” and similar parties. We’d like to think negotiations will progress from here and alight upon a solution in the not-too-distant future, but really there is very little hard evidence with which to make such an assertion. It may require blame to be increasingly shared equally between the two parties to get proper action. We continue to assess economic damage at the rate of 0.05% per week, meaning that the damage to-date now sums to between 0.2% and 0.25% in total, split between the tail end of 2018 and the beginning of 2019. Given that we had originally estimated a slight 0.2% boost from fiscal stimulus in the U.S. for 2019, this now suggests that the broader fiscal tailwind is beginning to turn into a headwind. In addition to the amusing photos of take-out fast food being served to White House guests, there are other quirky implications. For instance, certain pieces of economic data can no longer be published. Furthermore, should the shutdown continue through the end of this month, January payrolls will likely reveal the first monthly job loss in (an astonishing) 100 months. Of course, those job losses will be largely reversed whenever the shutdown ends. We continue to believe the key issues for China are its slowing growth rate, the offsetting delivery of fiscal stimulus, and the resulting debt risks. Chinese Q4 GDP was just released, confirming the expectation of a decelerating trend. The country’s annual rate of growth for 2018 was just 6.6%, the slowest in nearly 30 years, though hardly bad by any other standard. The country’s annualized growth rate in the fourth quarter specifically (as opposed to the Q4/Q4 YoY estimates widely announced) was just 6.2%. We continue to forecast just 6.0% growth across 2019, motivated by structural factors (lost competitiveness, slowing globalization, deteriorating demographics), cyclical impulses (the lagged effect of deleveraging efforts, slowing global demand) and idiosyncratic considerations (U.S. protectionism). Related to this, not much progress is being made vis a vis U.S.-China trade negotiations. Yes, the now familiar offers of “buy more soybeans” and “lower auto tariffs” continue to be made by China, but a) they are not new promises; b) they will not by themselves come close to eliminating the bilateral trade imbalance; and c) the real trade issues relate to China’s unorthodox economic structure. This is to say that even if there is a superficial trade agreement between the U.S. and China before the March 1st deadline, there is a good chance tensions flare up again not long after. China has already responded to its slowing growth trajectory with various forms of stimulus, spanning rate cuts, tax cuts and regulatory loosening. The country has furthermore indicated that more is coming, with rumors of a VAT tax cut, more business tax cuts and permission for local government to issue more bonds. For now, we believe the negative growth momentum more than offsets this extra stimulus, particularly given that China is reluctant to reignite its debt excesses. Given the lags involved, that narrative could begin to change into the second half of 2019, but that is not yet a certainty. This report has been provided by RBC Global Asset Management (RBC GAM) for informational purposes only and may not be reproduced, distributed or published without the written consent of RBC Global Asset Management Inc. (RBC GAM Inc.). In Canada, this report is provided by RBC GAM Inc. (including Phillips, Hager & North Investment Management). In the United States, this report is provided by RBC Global Asset Management (U.S.) Inc., a federally registered investment adviser. In Europe, this report is provided by RBC Global Asset Management (UK) Limited, which is authorised and regulated by the UK Financial Conduct Authority. In Asia, this document is provided by RBC Investment Management (Asia) Limited, which is registered with the Securities and Futures Commission (SFC) in Hong Kong. This report has not been reviewed by, and is not registered with any securities or other regulatory authority, and may, where appropriate, be distributed by the above-listed entities in their respective jurisdictions. Additional information about RBC GAM may be found at www.rbcgam.com. This report is not intended to provide legal, accounting, tax, investment, financial or other advice and such information should not be relied upon for providing such advice. The investment process as described in this report may change over time. The characteristics set forth in this report are intended as a general illustration of some of the criteria considered in selecting securities for client portfolios. Not all investments in a client portfolio will meet such criteria. RBC GAM takes reasonable steps to provide up-to-date, accurate and reliable information, and believes the information to be so when printed. RBC GAM reserves the right at any time and without notice to change, amend or cease publication of the information. Any investment and economic outlook information contained in this report has been compiled by RBC GAM from various sources. Information obtained from third parties is believed to be reliable, but no representation or warranty, express or implied, is made by RBC GAM, its affiliates or any other person as to its accuracy, completeness or correctness. RBC GAM and its affiliates assume no responsibility for any errors or omissions. All opinions and estimates contained in this report constitute RBC GAM’s judgment as of the indicated date of the information, are subject to change without notice and are provided in good faith but without legal responsibility. Interest rates and market conditions are subject to change. Return estimates are for illustrative purposes only and are not a prediction of returns. Actual returns may be higher or lower than those shown and may vary substantially over shorter time periods. It is not possible to invest directly in an unmanaged index. This report may contain forward-looking statements about future performance, strategies or prospects, and possible future action. The words “may,” “could,” “should,” “would,” “suspect,” “outlook,” “believe,” “plan,” “anticipate,” “estimate,” “expect,” “intend,” “forecast,” “objective” and similar expressions are intended to identify forward-looking statements. Forward-looking statements are not guarantees of future performance. Forward-looking statements involve inherent risks and uncertainties about general economic factors, so it is possible that predictions, forecasts, projections and other forward-looking statements will not be achieved. We caution you not to place undue reliance on these statements as a number of important factors could cause actual events or results to differ materially from those expressed or implied in any forward-looking statement. These factors include, but are not limited to, general economic, political and market factors in Canada, the United States and internationally, interest and foreign exchange rates, global equity and capital markets, business competition, technological changes, changes in laws and regulations, judicial or regulatory judgments, legal proceedings and catastrophic events. The above list of important factors that may affect future results is not exhaustive. Before making any investment decisions, we encourage you to consider these and other factors carefully. All opinions contained in forward-looking statements are subject to change without notice and are provided in good faith but without legal responsibility.